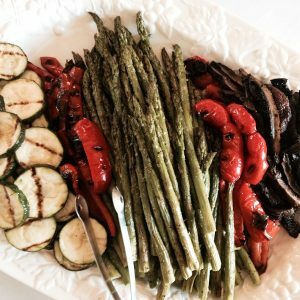 Event Description: LadyFingers catered a 50th Birthday Party for a couple who wanted to have delicious food that combined the unique with the traditional. 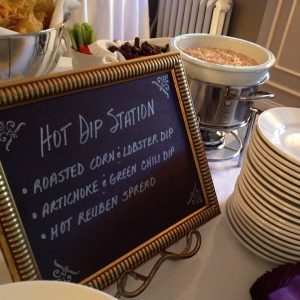 In addition to passed hors d’oeuvres, LadyFingers prepared a Hot Dip Station, a Mini Sandwich Station, a Skewer Station and a Mashed Potato Bar. Good food and fun were had by all at this party held in the Gibsonia neighborhood near Pittsburgh. Event Description: LadyFingers catered a swanky customer appreciation party for one of the area’s top web designers and business marketers. Guests included small business owners from around the Pittsburgh region as well as local celebrities. 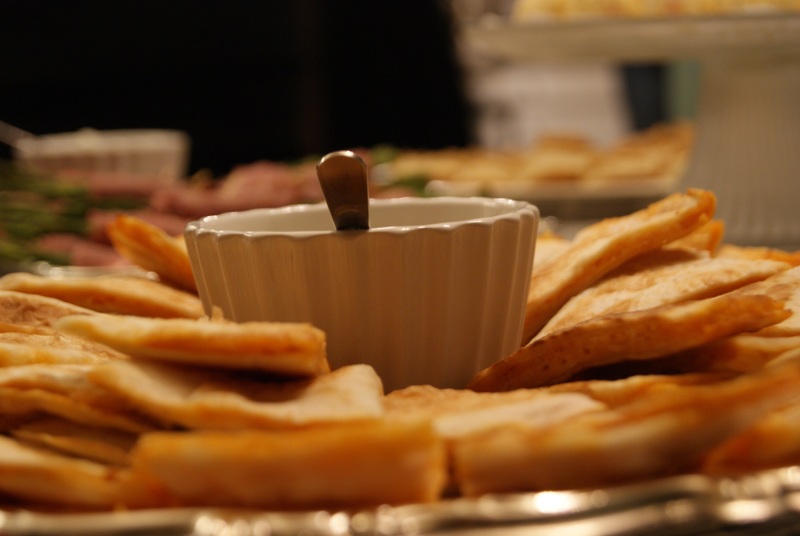 The food featured LadyFingers’ ever-popular Hot Dip Station along with an amazing selection of passed hors d’oeuvres. The customer appreciation party took place in one of LadyFingers’ favorite venues – The Mansion at Robin Hill Park. This fabulous party venue is located in the Moon Township suburb of Pittsburgh. 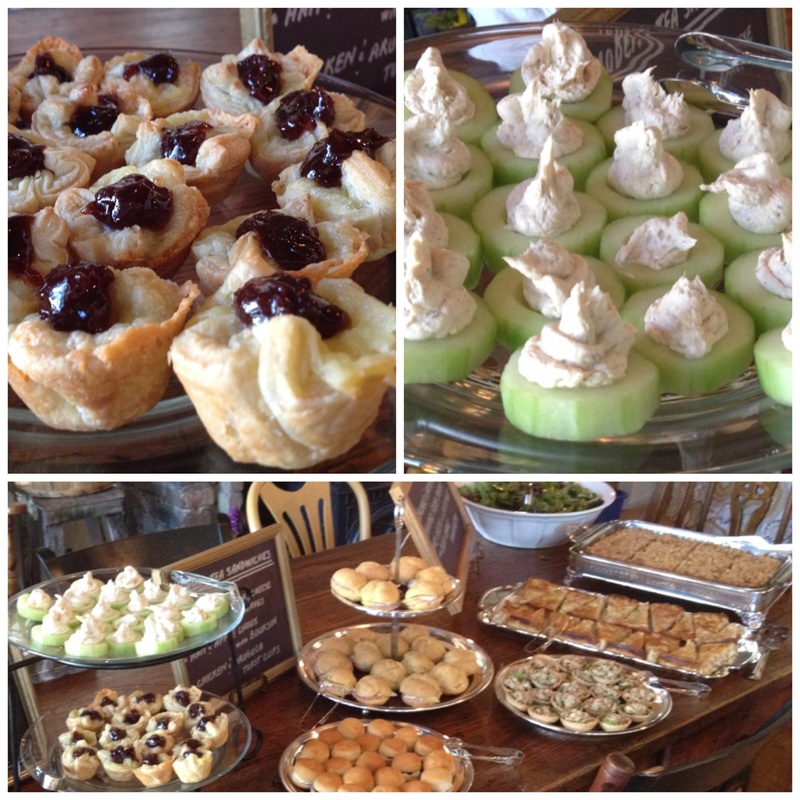 Event Description: LadyFingers catered a Bridal shower Brunch for a bride with a special theme – Harry Potter! The bride requested English-style foods, but also wanted at least two items featuring Brie cheese. LadyFingers created a Cheese and Fruit Display, finger food including Modern Tea Sandwiches, and a selection of delicious main course brunch items. 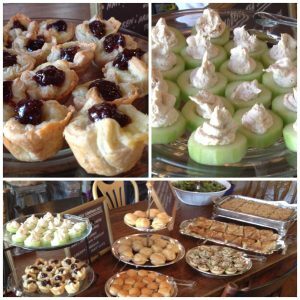 The bridal shower brunch took place in one of the most charming venues in Pittsburgh – Point Breezeway – which as the name suggests, is located in the Point Breeze neighborhood of Pittsburgh. Retro Birthday Party – 60’s and 70’s! Event Description: LadyFingers catered a 60’s and 70’s themed retro birthday party featuring modern food inspired by the fun food from that era. 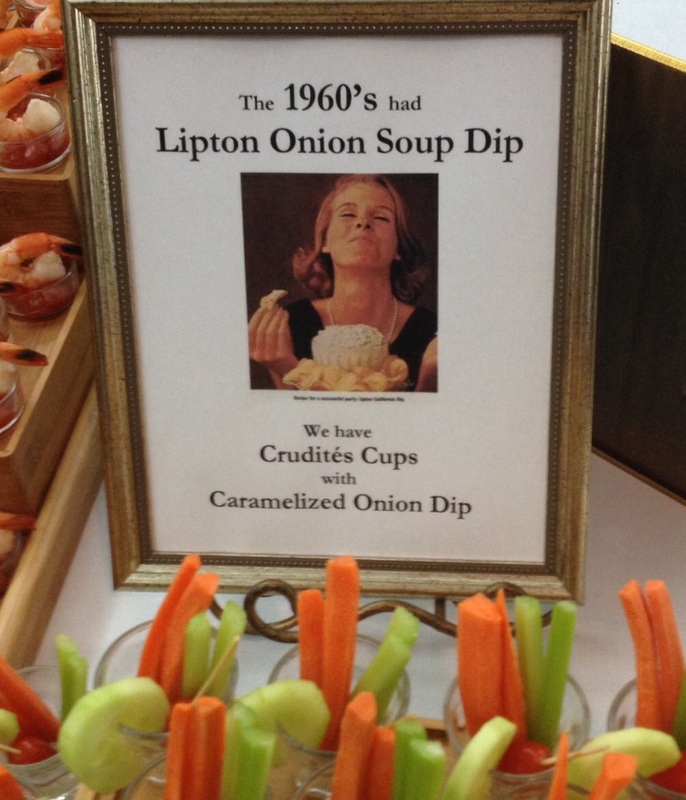 From mini grilled cheese sandwiches and tomato soup shots inspired by Andy Warhol’s famous soup can, to our popular Hot Dip Station inspired by 70’s fondue, LadyFingers brought back yester-year with up-to-date interpretations. The tie-dyed and bell bottom-clad guests at this one-of-a-kind retro birthday party were grooving in the Community Center in the Rosslyn Farms suburb of Pittsburgh. Surprise Birthday Party – Happy 60th! Event Description: LadyFingers catered a formal surprise birthday party (complete with gowns and tuxedos) for a family celebrating their father’s 60th birthday. 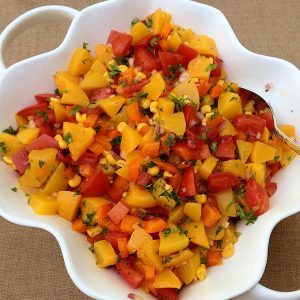 The party featured passed hors d’oeuvres and and an upscale Quesadilla Station in their home in the Peters Township suburb of Pittsburgh. Event Description: LadyFingers catered a delicious wedding reception brunch for a couple whose guests required many dietary modifications. 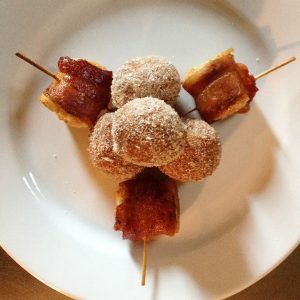 LadyFingers created gluten-free donuts and breads for “Coffee Hour” and made special brunch plates for members of the bridal party with dietary restrictions. 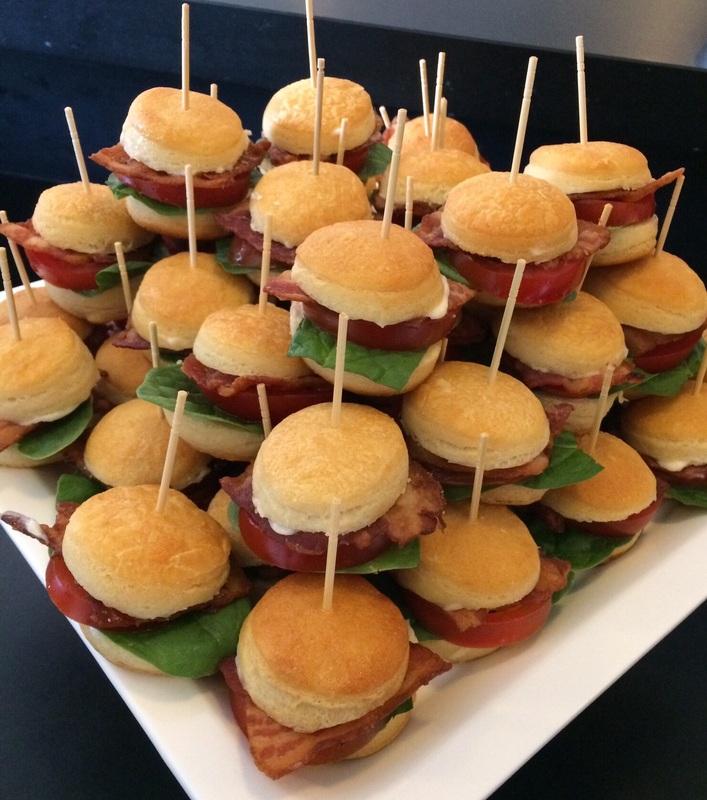 The reception featured an assortment of sweet and savory “Coffee Hour” finger foods as well as hot and cold main course brunch selections, all served at the beautiful Church of the Ascension in the Oakland neighborhood of Pittsburgh. 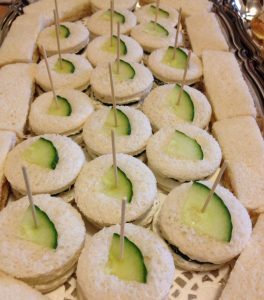 Event Description: LadyFingers catered a wedding reception for a couple who married in Ireland and wanted to have a fabulous party with their family and friends. The reception featured passed hors d’oeuvres and food stations in the backyard of their Pittsburgh home. Event Description: LadyFingers catered a graduation party celebration featuring food stations at a beautiful Bell Acres home near Pittsburgh. 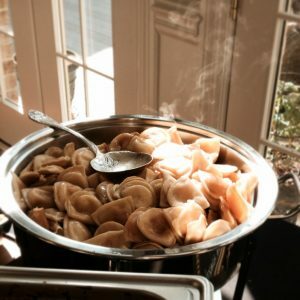 Stations included an Artisanal Cheese and Fruit Station, a Macaroni and Cheese Station, a Pierogie Station, a Carving Station and a Salad Station. Event Description: LadyFingers catered a baby shower garden party at a home in the Coraopolis suburb of Pittsburgh. The food was served outdoors under the cover of a beautiful backyard “barn”. Food included a Hot Dip Station, Tea Sandwiches, a Pierogie Station, a Cold Salad Trio and a Meatball Bar. Event Description: LadyFingers catered a graduation party featuring food stations under a large tent in the backyard of a Franklin Park home near Pittsburgh. Stations included a Hot Dip Station, a Macaroni and Cheese Station, a Pasta Bar, a Skewer Station and a Salad Station. Copyright © 2018 Ladyfingers Pittsburgh Catering. All Rights Reserved.